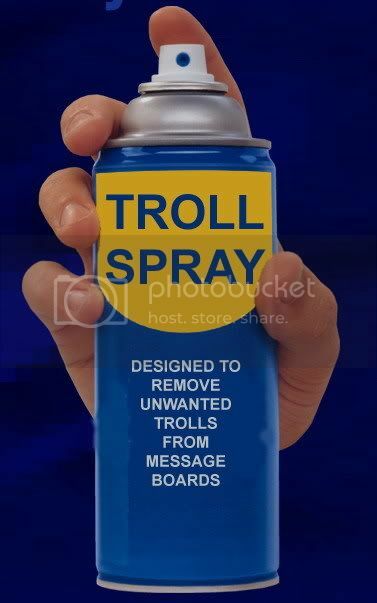 If anyone out there who owns a forum wants a particularly pesky troll to play with, or if you just want the pleasure of killing one, I've just encountered one in my new role as a moderator that I will be happy to send your way. I have to warn any trollhunters who may be interested that this one is underage (being 16) and so its awfully clumsy in its attempts to gain access to closed fora. It does leave a trail in other fora wherein it positively states its is underage and living at home. However, it claims that this is a typographical error when told its too young for most occult fora and that this is a legal matter in some countries. It also moans a lot about how difficult it is to learn anything [about traditional witchcraft] from the internet. This one is particularly annoying in that it continously changes its IP address in order to avoid being banned. Unfortunately, it doesn't change its spelling errors, syntax or remove its profiles from other fora thereby making it easy to catch out. Oh, and its tries to be tricksy in that it says its leaving your forum, it will leave you alone and within 24 hours its trying to get back on. So, any troll hunters willing to take this one on? No, thank you my dear, I get quite enough of my own trolls, idiots and irritations on Whitewicca without relieving others of theirs! If you're using phpBB forums, it's occasionally worth changing from self-activation via email to Administrator approval only - it only takes a day or two before they get frustrated and go away. At the moment, it's fun trying to outwit you and get the better of you, so it'll keep happening - any attention is better than no attention. Just my view, but I've been running my forum for six years now and had one or to really difficult little boogers to deal with. We do use email registration and one of those visual tests as well. Unfortunately, until someone posts you have no idea who they are. We banned this one IP, servers and email addys and it kept changing them all. Stupidly, though, they kept misspelling the same thing, so its easy to see its them again. Of course, they also promised (via email) never to bother us again. Firenne, truth, being the ideal means this one was never going to fit into our little group. Its quite disappointing to see such behaviour and it tends to make you rather jaded.